For you history buffs, the Verdamper was developed by Evert, a close friend of modern vape pioneer Eagle Bill. 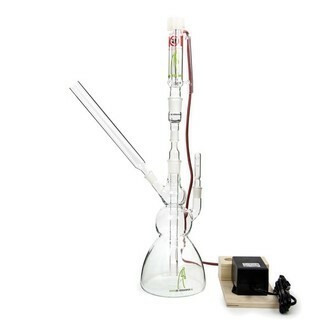 Bill had used a paint stripping gun and large demijohn bottle to bash together a leaky but workable DIY vape. Evert modified this into the reliable, non-leaky Verdamper in the mid-90s for selling to the public. The Verdamper is incredibly popular in The Netherlands, but it's a little less known outside The Netherlands. Certainly, it’s the vaporizer of choice among Amsterdam coffeeshop owners with which to assess the taste and strength of incoming produce. 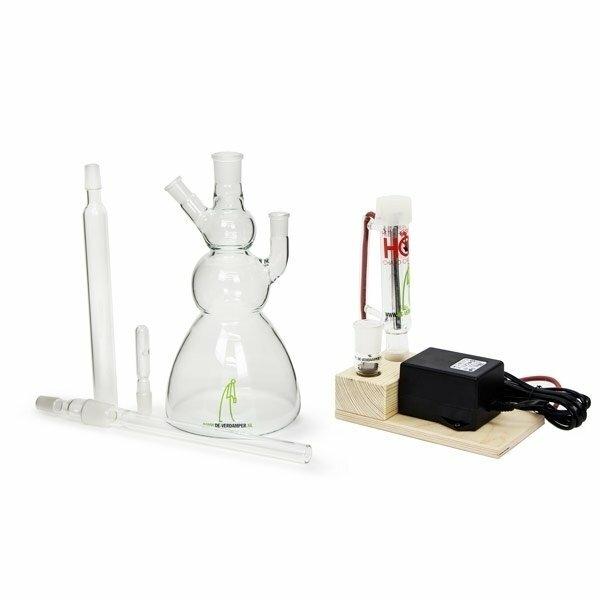 Vaping itself is a clean and healthy way to consume cannabis, but with the Verdamper you have the added feature of water filtration (one of only two vapes which offer this), which gives you an even cleaner and more flavoursome taste. The Verdamper’s heating chamber is a separate glass component connected to an electric power supply by a cord. There’s no temperature control on the Verdamper, but the heating device can increase temperature if you place your hand on top of it to block air from entering. There is a label on this heating device warning that it gets hot. It does – the maximum temperature is 200°C (392°F). Like the Dutch, the Verdamper is very practical and no-nonsense. It’s a vaporizer that’s stripped-down to its basic functionality, and definitely a conversation piece. It comes in two Deluxe versions: Large (2000 ml jar, 45 cm high) and Small (1500 ml jar, 38 cm high). Connect the heating element and put it in the holder (if using for the first time, let it heat for 10 minutes using). Fill the jar about half-way with water, so no water will come into your mouth when sucking on the tube. Fill the head with ground herb. Place the heating element on the head. When the heating element has reached the right temperature, after around 5 minutes, you can start vaporizing by sucking and inhaling the vapors from the tube. You can raise the temperature by carefully covering the heating element with your hand or a piece of paper. Transformer (230 - 12 volts) on wooden block. The warranty on the heating element of the Verdamper is 1 year. There's no warranty on the glass parts.